Individual dining place settings represent the standard amount of space required to accommodate a single diner. 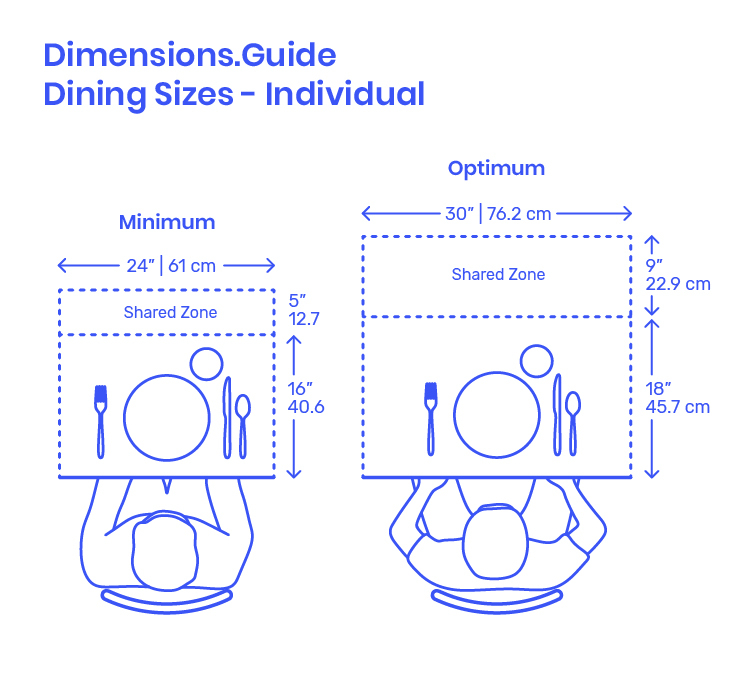 Split into Minimum and Optimum place settings, these dimensions account for the variety of dinnerware, tableware, cutlery, and glassware that a person might need during a meal. Each place setting includes a secondary shared zone at the center of the table that combines with adjacent place settings to provide enough room for collective serving dishes and platters. Minimum individual place settings have an overall width of 24” | 61 cm, overall depth of 21” | 53.3 cm, and are split between a 16” | 40.6 cm place setting and a 5” | 12.7 cm shared zone. Optimum individual place settings have an overall width of 30” | 76.2 cm, overall depth of 27” | 68.6 cm, and are split between an 18” | 45.7 cm place setting and a 9” | 22.9 cm shared zone.